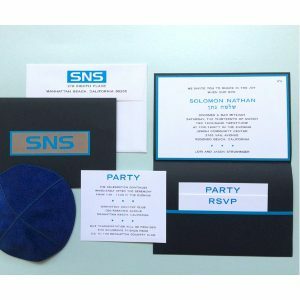 This handsome Bar Mitzvah invitation with a horizontal layout and top fold features a silver metal tab that has been laser die cut with your 3-initial monogram and allows the Tabriz Blue layer below to show through. Your wording details will print on Avon White Linen stock which is layered over Tabriz Blue stock and placed inside a Black Linen pocket folder. This handsome Bar Mitzvah invitation with a horizontal layout and top fold features a silver metal tab that has been laser die cut with your 3-initial monogram and allows the Tabriz Blue layer below to show through. Your wording details will print on Avon White Linen stock which is layered over Tabriz Blue stock and placed inside a Black Linen pocket folder. The pocket with a Tabriz Blue trim will securely hold all of your enclosures in place. Measures 5-1/4″ high by 7-7/8″ wide. Shown with lettering styles Trade Gothic Caps (body copy), HandelG (laser initials), and optional Hebrew Hadassah and Black/Tabriz Blue inks. The Reception and Response enclosures will print on single Avon White card stock in varying sizes so that when placed inside the pocket a stacked appearance will be achieved. This top-quality Bar Mitzvah invitation is accompanied by single Avon White Linen envelopes. Additional postage may be required. Please consult your local Post Office for details prior to mailing. Please allow up to 3 weeks for production time for this fine, high-quality invitation. Would you like to add Hebrew name to the invitation for an extra charge of $74? If so, please provide the child's Hebrew name in English and, if possible, spelling of name by indicating names of the Hebrew characters in the field below, clearly specifying order of placement. For example: Rachel - Lamed (far left), Chet (middle), Resh (far right). Note: Click on Wording for Sample Wording ideas. Up to 14 lines of text are included. 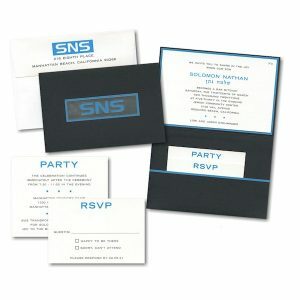 Additional lines will add $2 each to the total cost of your invitations regardless of quantity.